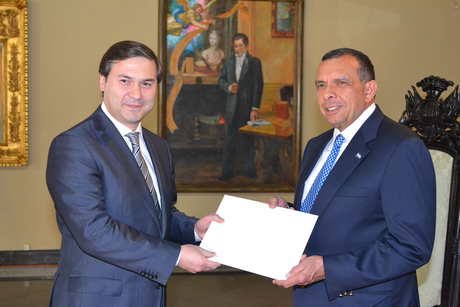 Azerbaijani ambassador to Mexico Ilgar Mukhtarov has presented his credentials to President of Honduras Porfirio Lobo Sosa,AzerTag state news agency reported. The ambassador conveyed greetings of Azerbaijan`s President Ilham Aliyev to the Honduran President. Mukhtarov expressed hope that mutually fruitful cooperation between Azerbaijan and Honduras would continue to develop successfully. President Porfirio Lobo Sosa asked the diplomat to convey his congratulations to President Ilham Aliyev on his re-election. The president noted his country`s interest in expansion of cooperation with Azerbaijan. The sides also discussed political, humanitarian, economic, trade and energy cooperation between the two countries.